Daniel recently graduated from his Master’s with Samuel Coles at the Royal Academy of Music, with Distinction, DipRAM, and the Alumni Development Award for ‘singularly distinguished studentship’. Before this, he graduated from Oxford University with a First in Music, and attended the Purcell School, winning the Felsenstein Leaver’s Award. Daniel’s playing has been described as “shapely and silvery” (Classical Source, 2017) and possessing “virtuosity, charm, and charisma in abundance” (The Telegraph, 2014). He is a passionate orchestral musician, currently on trial as principal piccolo of the City of Birmingham Symphony, having been a member of the European Union Youth Orchestra, and having appeared as principal flute with the Britten Pears Orchestra. He has performed professionally with groups such as the Multi-Storey Orchestra, Oxford Philharmonic, and Sinfonia Cymru. 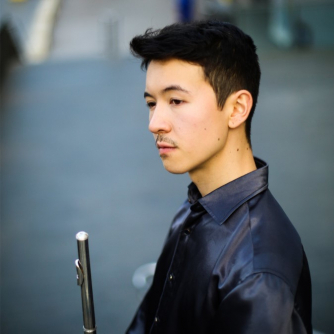 Daniel has won many awards, including the British Flute Society Young Artist Competition, the Oxford Philomusica and Brighton Springboard concerto competitions, RAM’s Chris Taylor Flute Award, and the Royal Overseas League’s ‘Sussex Prize’. He was a wind finalist for BBC Young Musician 2014, broadcast on BBC TV and radio. Daniel has performed concertos with the Oxford Philharmonic, Czech National Symphony, Amadeus Orchestra, and Kingston Chamber Orchestra, and has given solo performances at venues including Wigmore Hall, Cadogan Hall, and the Royal Albert Hall’s Elgar Room. He is grateful for support from the Countess of Munster Trust (for whom he is a recital scheme artist) and Hattori Foundation. ​Joseph Havlat was born in Hobart, Australia, and studied at the Royal Academy of Music in London under Prof. Joanna MacGregor from 2012-18. Joseph has performed in major concert venues around the UK and in Europe, America, Japan and Australia as a soloist and as part of chamber groups and orchestras. He is a keen sock enthusiast and chamber musician, performing frequently with multiple groups - Tritium (clarinet) trio, Trio Derazey, Duo Ex Libris as well as the LSO percussion ensemble, with whom he toured Japan in 2018 giving the premiere of a work by John Adams. Passionate about contemporary music, he is a founding member and artistic director of contemporary music collective Ensemble x.y and is also an avid composer, having written for the aforementioned ensembles, among others. Having now graduated from the Academy, he is there serving as a Piano fellow for 2018-19, having also been a Chamber music fellow for the previous year.